We want to let you know about what we are up to with the main news from the last month regarding the OpenNebula project, including what you can expect in the following months. We are excited about China Mobile’s impressive announcement of their Mobile Cloud based on OpenNebula! Read below. Winter is coming, be prepared with the warm Fox Fur of the new stable release of OpenNebula: 4.10. Did you have a chance to try it out yet? We would love to hear your feedback, so we have time to include possible changes in the next maintenance release. You can reach us through the user mailing list, praise is also welcome! But we do not kick back and coast, and we have already started work that will eventually lead to OpenNebula 4.12. This release ships with several improvements in different subsystems and components. But probably the most important novelty is the new integration with VMware vCenter. OpenNebula 4.10 is able to interact with a farm of ESX servers without contacting them individually, but rather through their associated vCenter. This turns Fox Fur in the first OpenNebula release that allows to automatically import an existing infrastructure, since the new vCenter drivers allow to import Clusters and Virtual Machines from a vCenter installation, significantly smoothing the set up curve. Adding to the above, this integration will leverage vCenter advanced features such as vMotion, HA or DRS scheduling provided by the VMware vSphere product family. OpenNebula will expose on top of existing vCenter clusters a multi-tenant, cloud-like provisioning layer, offering virtual data centers, datacenter federation or hybrid cloud computing to connect in-house vCenter infrastructures with public clouds. In this manner, adopters will take a definitive step toward liberating their stack from vendor lock-in. Fox Fur also introduces an integrated tab in Sunstone to access OpenNebula Systems professional support, avoiding disruption of work and enhancing productivity. Moreover, several improvements are scattered across every other OpenNebula component: improvements in the hybrid drivers, including better Sunstone support, improved auth mechanisms (login token functionality) and many bugfixes stabilizing features introduced in Lemon Slice. Our community has been very active this last month. For instance, do you like Ansible and OpenNebula? Look no further! Read here how this two proven technologies play with each other, thanks to Vincent Vanderkussen. Are you instead living on a Windows world, and like .NET? Play with OpenNebula as well thanks to our partners at Terradue. OpenNebula keeps growing in Croatia, with a new web hosting company presenting their Win VPSs based on ONE. Also, It’s always refreshing to see how OpenNebula is helping people, thanks Daniel for sharing! Spanish speakers can dwell into this study, placing OpenNebula as the only european open source technology to build clouds. Comparing with others is always a healthy exercise, check out Carlo view on OpenNebula and OpenStack. This year’s OpenNebula Conference, to be held in Berlin 2-4 of December, 2014 is round the corner. Check the final agenda at the conference page, with folks from PuppetLabs, E-Post, Deloitte and many other companies sharing their experiences with production clouds based on OpenNebula. Moreover, check out the venue for the evening event, and register soon if you like it since there are few places available. Last but not least, if you are interested in reaching a wide cloud audience, check the sponsorship opportunities for the OpenNebula Conference 2014. If you live in Spain, and around Extremadura, do not miss out the OpenNebula course next 11th and 12th of this month. OpenNebula team members were on the road this last month to spread the OpenNebula word. For instance, in Santiago de Compostela, Spain, a TechDay was held with Agasol, with great audience response. We learned for instance how the Supercomputing Center of Galicia (CESGA) is using a hybrid OpenNebula cloud. OpenNebula was present in Europe ICT Proposer’s Day. We were also present in the spanish Digital Agenda Day, where both the OpenNebula project and OpenNebula Systems expressed their inconditional love for open source technologies. In our mission of spreading we went to Düsseldorf for the LinuxCon Cloud Open. 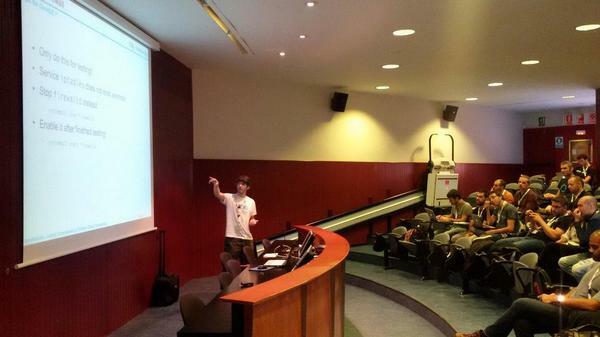 And held another Tech Day in Barcelona, where a great and numerous audience learned about OpenNebula. We have more upcoming TechDays in future months, if you are interested in OpenNebula you can check the project page.